Five days into a multistate Amber Alert for a teenage girl in "grave danger," San Diego officials confirmed that the second body found in a burned-out home is that of the missing girl's 8-year-old brother. The San Diego County Sheriff's Department Friday night confirmed that a second body found in the burned-out home is that of Ethan Anderson, whose 16-year-old sister Hannah remained still missing, believed to have been abducted by family friend James Lee DiMaggio. Initially, investigators believed the boy was also traveling with DiMaggio and Hannah. He was described as 4 feet 11 inches tall, weighing 65 pounds, with sandy blond hair. Before Friday night's confirmation, family members – including the children’s father Brett Anderson – had implied that Ethan was found dead along with his mother, Christina Anderson, in DiMaggio's home Monday. Emergency personnel were called to the 2000 block of Ross Avenue in the unincorporated community of Boulevard east of San Diego about 8 p.m. Sunday for a structure fire. DiMaggio's log cabin-style home and detached three-car garage were engulfed in flames. The bodies of an adult, child and dog were found in the charred rubble. DiMaggio, 40, is accused of killing Christina and Ethan Anderson, then abducting Hannah Anderson. Detectives have not released the cause of death. DiMaggio's blue Nissan Sentra was found Friday in a rural community in Idaho known as the River of No Return Wilderness. The sedan -- the description of which has been published in nationwide media reports -- was found covered in brush with its license plates removed about 15 miles east of Cascade, Idaho, approximately 80 miles north of Boise and roughly 400 miles from the Canadian border. DiMaggio and Hannah have been spotted near Morehead Lake, officials said Friday. A horseback rider had a brief conversation with the pair, but saw no reason to be alarmed. He told officials they appeared to be hikers or campers, which are common in the area. 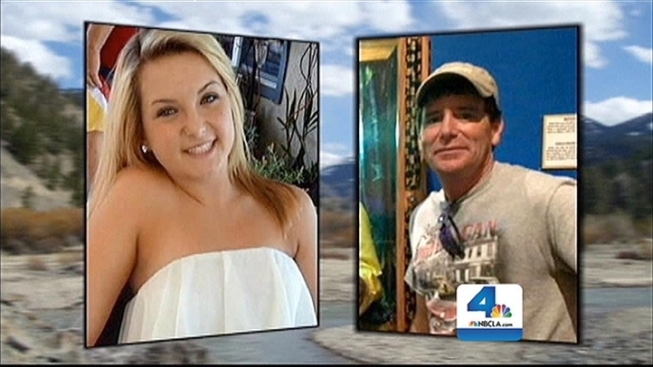 Initially, investigators believed Ethan was also traveling with DiMaggio and Hannah. Friends and family have been holding vigils for Ethan, calling the young boy a great kid with lots of friends who love him. Officials have not released how Christina Anderson and her son were killed. They also have not identified a possible motive. "We all have come up with a theory but really it is speculation and we wont know until we get Hannah and DiMaggio back here for further questions," San Diego County Sheriff William Gore said. Christina's father, Christopher Saincome, said his daughter went to visit DiMaggio's home to say goodbye to the family friend before he moved to Texas. Hannah Anderson attended El Capitan High School in Lakeside, where friends described DiMaggio as having a crush on the 16-year-old girl. A memorial fund has been set up to help the family with burial costs. Go to WePay and search for "San Diego Anderson Family Support Fund."